I am about to leave LA so I will briefly review my trip. I left Alexandria and crossed the Qal (Quaternary alluvium, less than 10 KYA), as seen this photo; Alexandria is where the coin is. The dash line is my path. As I drove north, the pink Qal was flat with farms but where I crossed exposures of the Pleistocene terraces (aka Pt), linear ridges were present as seen in previous post. 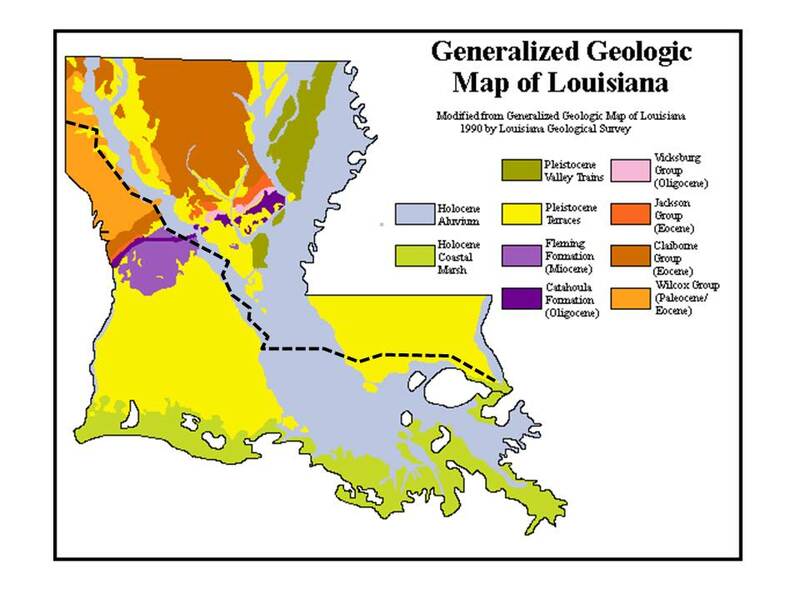 As I crossed into the Miocene sedimentary rocks (light purple), the terrain became hilly until Shreveport (westward turn near top of path). However there was much more variability than the map suggests. 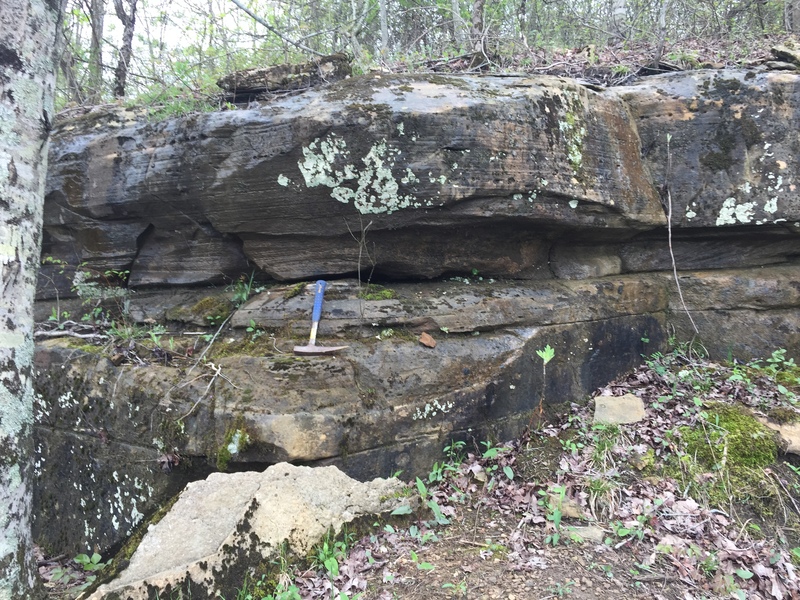 Here is photo of hilly Miocene I am now at Love’s in the Paleocene Wilcox Group, but there is a deep-crustal uplift (Sabine Arch) and erosion has revealed the younger Eocene Claiborne Group sediments at Gilmer. 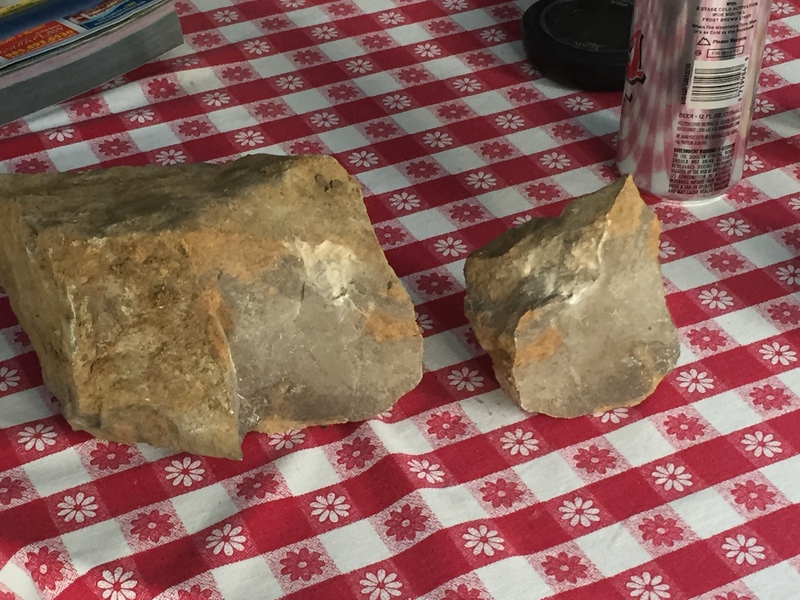 These rocks are time-synchronous with the rocks I briefly described as I drove to Hawk Pride last month, but they are different because the sediments that formed them were further from a source of erosion (i.e. Ancestral Southern Appalachian Mountains). This trip, as I drive northwest, the rocks get progressively older because of the down-warping beneath the MS river (note that erosion removed any rocks that were exposed to the wind and rain…etc). 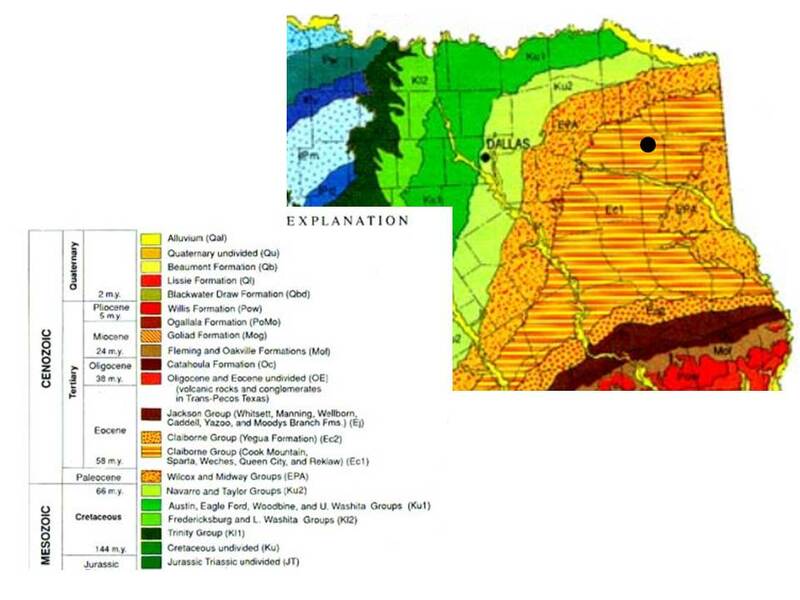 This photo shows the geologic map of NE TX, with the park indicated by a black circle. The oldest rocks I will encounter are Eocene Claiborne Group sedimentary rocks, which were deposited in an environment just like the mouth of the MS River today! 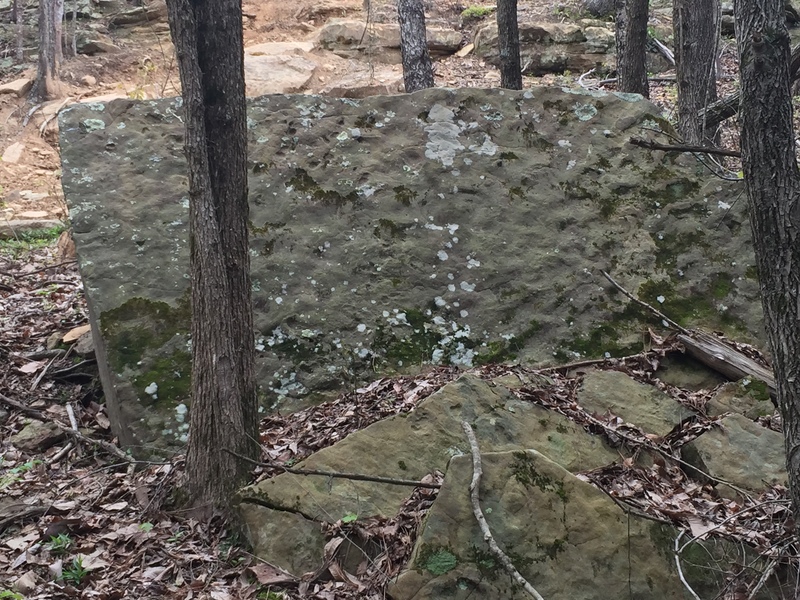 The dominant rock type in the park (Gilmer, TX, Ushur County) is a sandstone, but anyone who has been wheeling there will tell you about the sticky! mud. 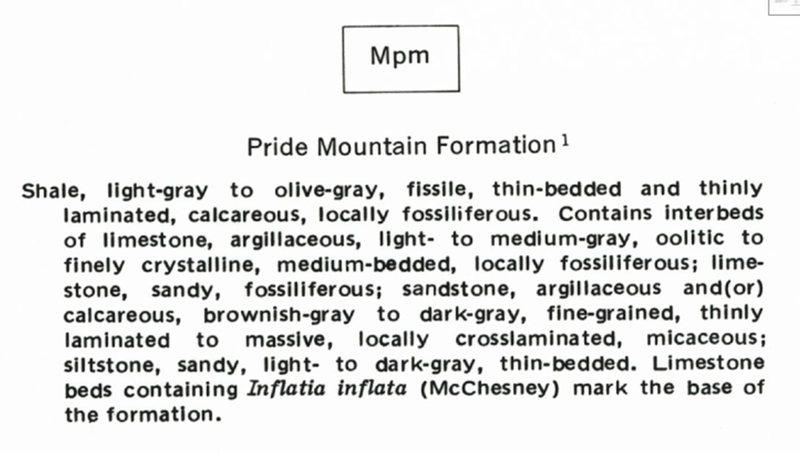 The name of the primary stratigraphic unit (aka formation) is the Queen City Sandstone (a group comprises several formations), but I bet there is some mud in there if the sediments were deposited in a delta front environment! 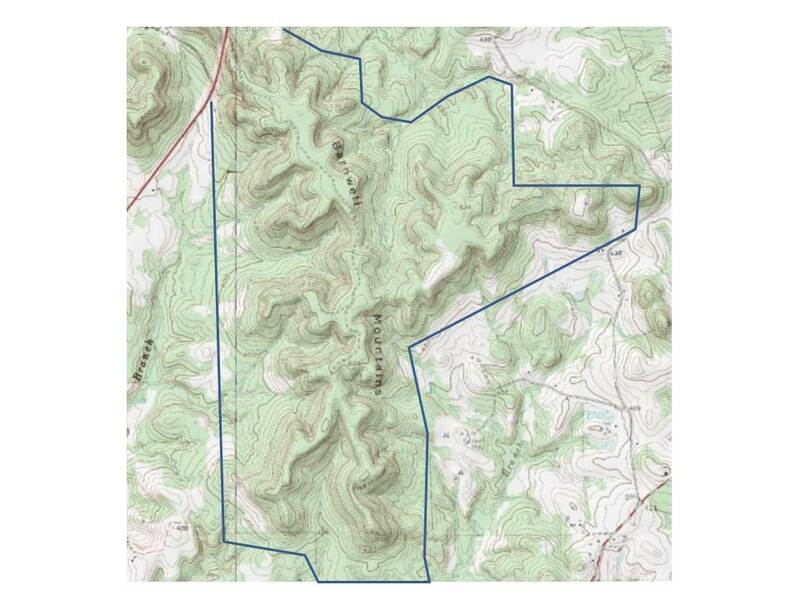 This topographic map, with the very rough outline of the park, shows the topographic relief to be about 200 feet, but the park encompasses the entire mountain. I hope to see if I can identify changes in the sedimentary facies within this small area. Looking forward to a great time-travel trip…see you then! 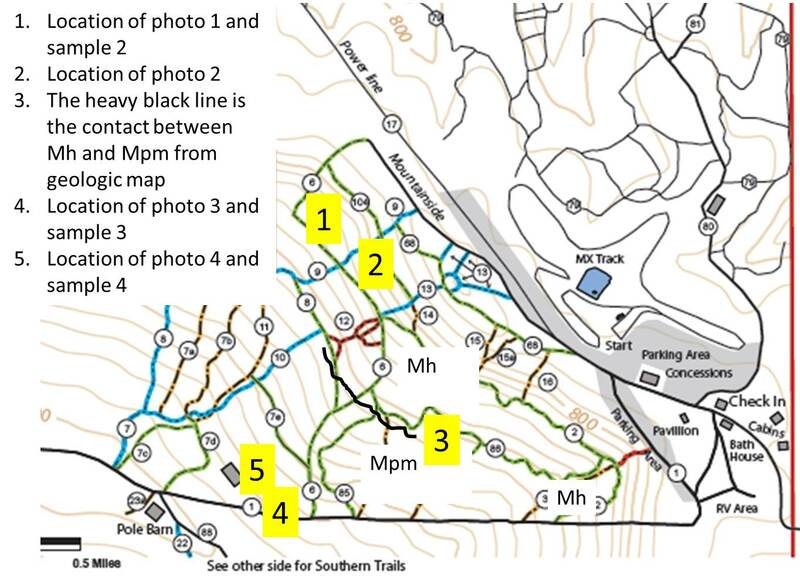 I want to add one last comment, which addresses my original objective in this wheeling/geology trip; why is Mountainside, which is a low-gradient road cut down the north side of Thompson Hollow, more difficult to traverse when it rains than Big Hill, which goes right up the mountain? My limited field work suggests that the answer lies in the original distribution (horizontally as well as vertically) of clay sediments in the Mississippian. The transition from shallow ocean (i.e. fossil-rich thin beds of limestone and dark shales) to coastal sediments (i.e. the Hartselle Fm. red sandstones and shales with some limestone) during this period produced rapid changes horizontally in facies, which are environmentally dependent groups of sediments (later rocks). I think that coincidentally, there was a barrier island system on the south side of Thompson Draw with thinner layers of mud between thin sand layers. Thus, Big Hill and Mountainside must traverse more shale (now mud) than 1/2 mile to the south. 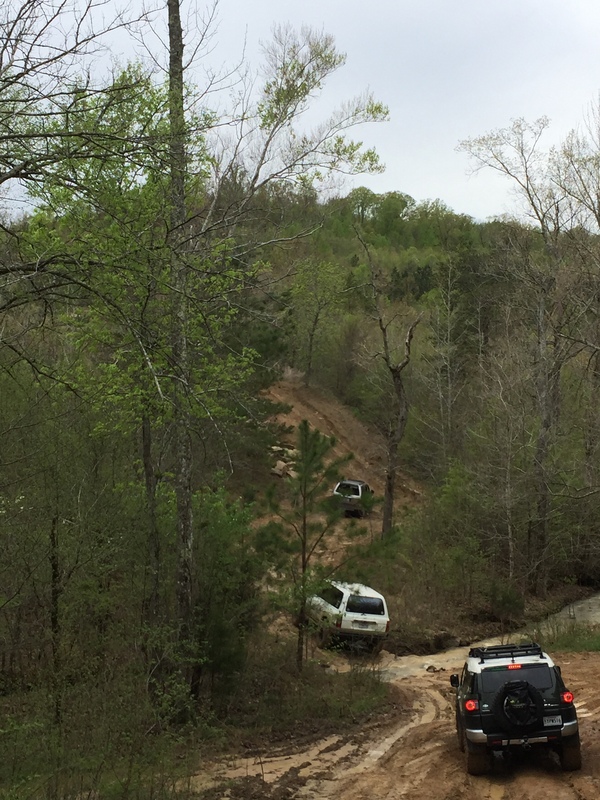 When Mountainside was cut with a dozer, it produced a trail/road that has a greater extent of slippery mud when it rains. This same section (from ~500 -700 feet) on Big Hill is crossed in a series of swales and sandy ridges that are easier to traverse in sections. There are slippery sections of John’s Way (the escape route out of Thompson Draw) but overall it is sandier. 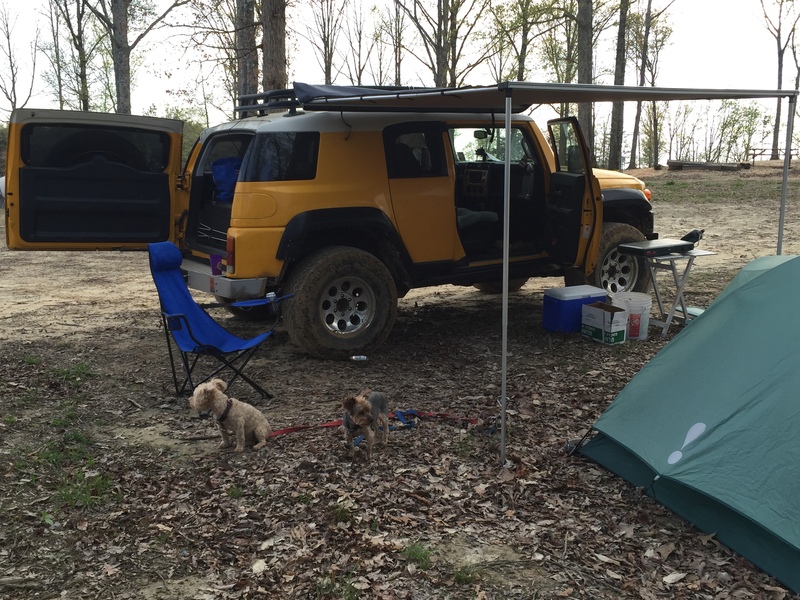 This post attempts to relate the previous comments to the four-wheeling experience in northern AL. First, I am going to show some photos of trucks meeting these rocks up close. 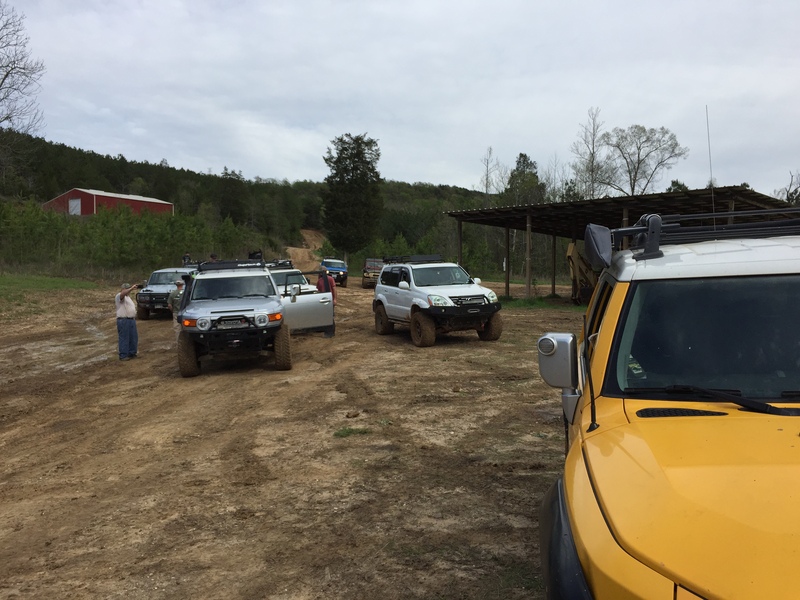 This photo says a lot about HPORV park…my truck is parked on a flat, muddy, area with 3-6 foot ledges to the right side. This was taken in the Hartselle Fm., which contains sandstones and shales (i.e. sand and mud). The shale was originally mud and when the shale, which is the rock that results from ~20 km depth of burial, is exposed to rain and weathering, the result is mud! This same spot is slimy when it rains (which it did the same night after this photo!). But it is not a mud hole because it is underlain by sandstone rock, which prevents deep erosion by truck tires. 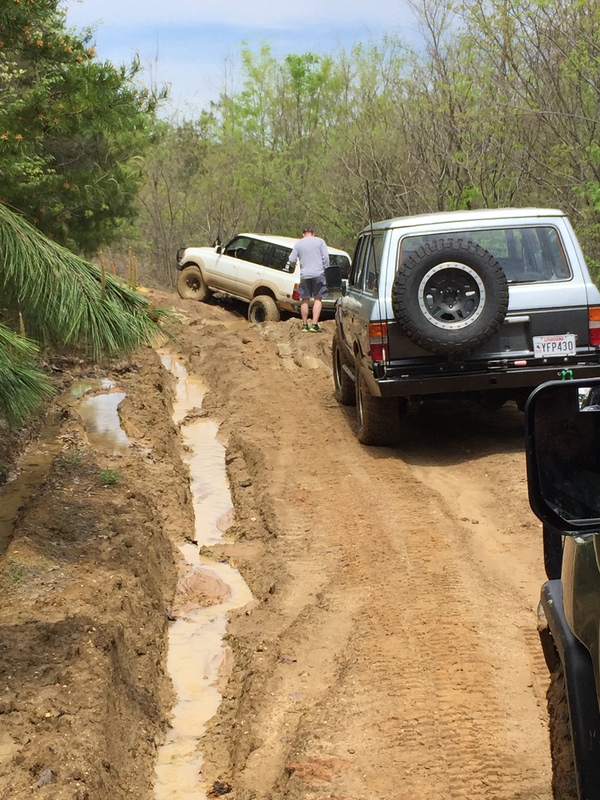 This photo, taken the next day, shows how the trail changes after a heavy rain and the mud is liquefied by vehicles and hysteresis. 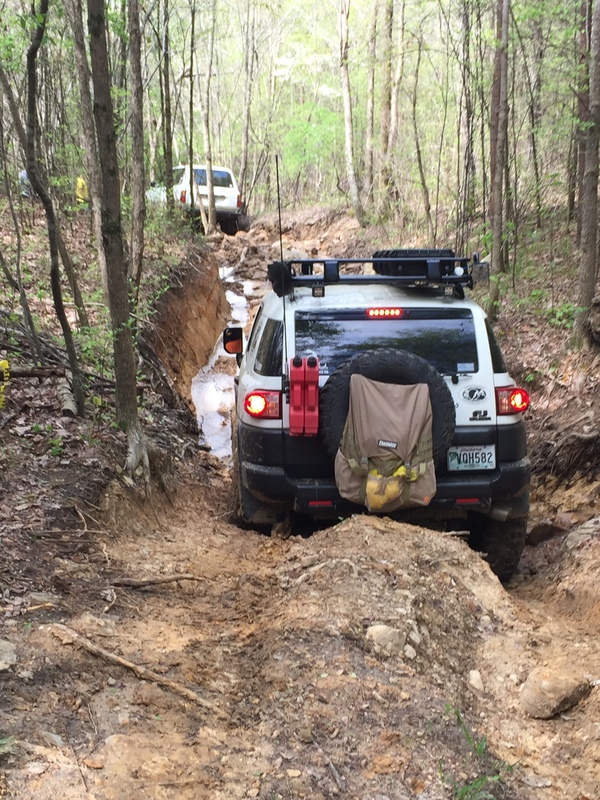 When the trail crosses a natural drainage (it rains in AL! ), the crossing is very difficult, as demonstrated by our trail leader, who had to winch himself…the rest of us used tow straps or made it (50/50). 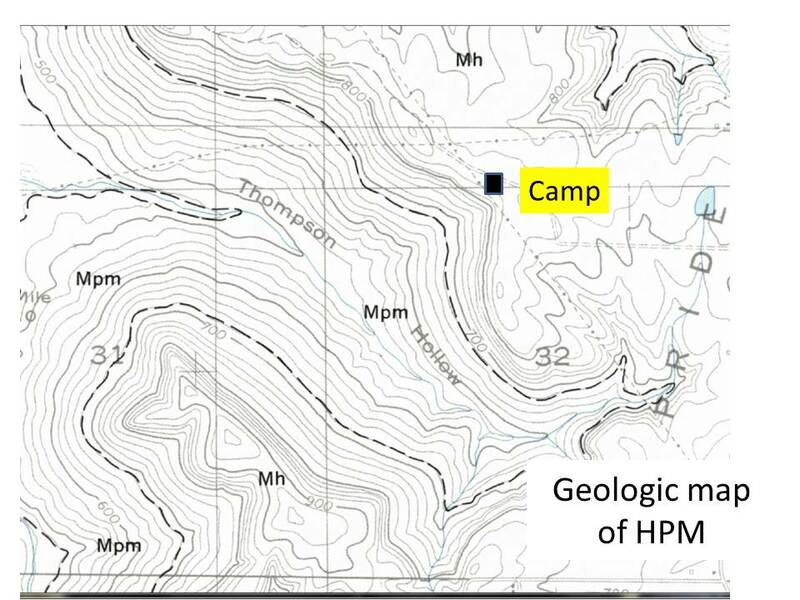 The geologic map uses the symbol Qal for the recent (~10000 years) sediment that accumulates at the of bottom hills like those surrounding Thompson’s Draw. 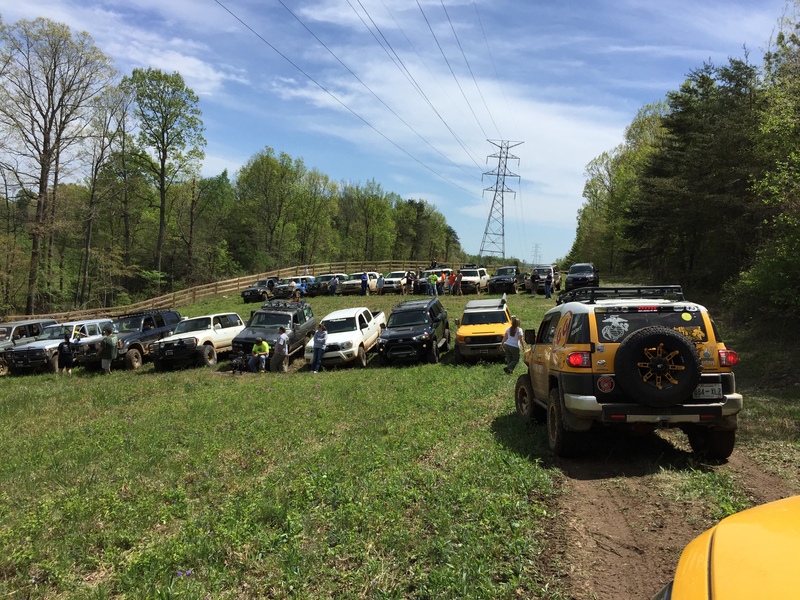 Here is a photo of everyone breathing a sigh of relief near the lowest point of the park…the lowest point includes the “mud bog”, but it was just too hard to get there after the rain…LOL! One of the results of weathering of a sandstone is the accumulation of blocks downhill. I showed some photos of these in a previous post. We took a trail on the north side of Big Hill that shows what this is like up close. This first photo shows the entrance to a natural gulley, which really works the suspension. 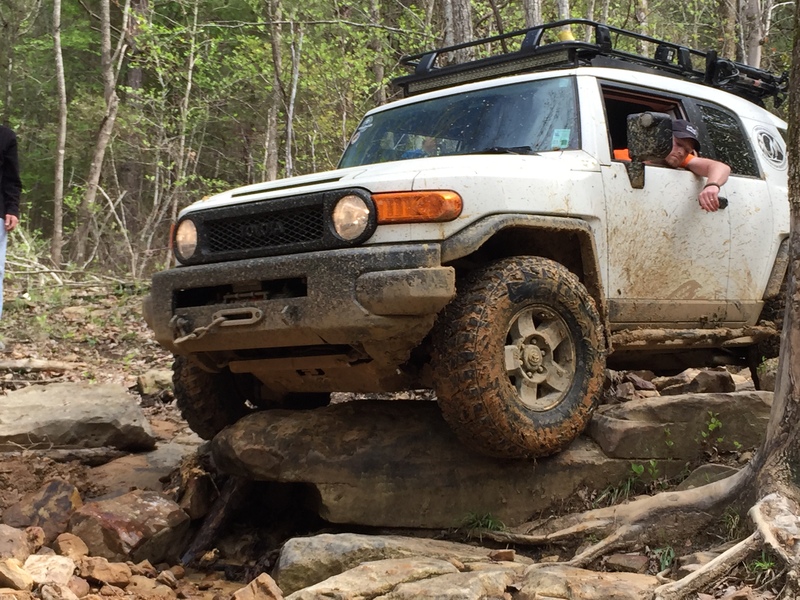 He got some winching from the trail leader and made it until an even bigger ledge appeared (sorry, no photos…I was helping…LOL). I made it down this ravine with no assistance partly because it is always easier to follow and see how the rocks fall (so to speak). My last photo is of the tranquil scene from the top of the Hartselle, where rain and snow haven’t produced the difficult landscape we traverse below. My final comments relate to the similarity of the environment ~320 mya and those today, notwithstanding the elevation changes. These rock were all flat and all relief is due to erosion. This is very different from the situation 1000 miles to the north, where the slightly younger Pennsylvanian Pottsville Fm. represents the mountain building occurring there at this time (see my previous post). The northern ancestral Appalachian Mtns were close to the massive collision whereas the southern extent (i.e. AL) was a more peaceful environment, with barrier islands, bays, mud flats, and shallow seas. Even after ~300 million years we encounter this geologic memory of those environments, remembering that our ~400 feet drive up and down Big Hill traverses about 20 million years…LOL! As noted in the previous post, the Pride Mtn formation was dark shales and sandstones at the type locality I visited. The previous post discussed the younger (on top…Upper Mississippian…~330 mya) Harstelle Formation. This post shows some photos of the Pride Mtn Formation. After meeting Big Hill from Mountainside, I stopped and collected a hand sample, which is limestone (HCl fizzes in contact), and took a photo of the exposure. Here is the exposure, after hundreds of drive-overs by four-wheelers. Even after so much punishment, this bivalve (unknown to me at this time) survived! The USGS briefly describes the Hartsell Fm. in this general area as “Thin-bedded, fine-grained sandstone and greenish-gray shale interbedded with coarse limestone. Thickness 0 to 60 feet.” After returning to HPMORV park, I took a drive down the trail called “Mountainside”, which drops from ~850 feet to ~600 feet elevation. 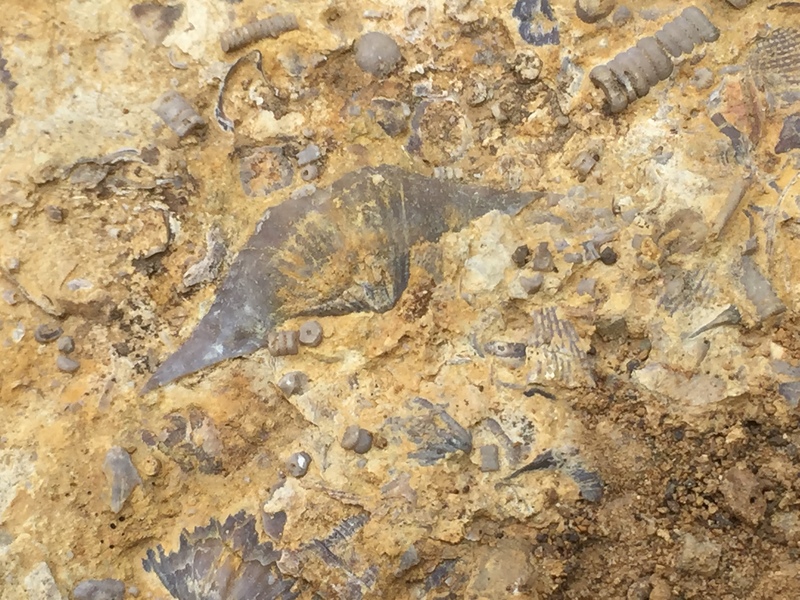 I collected a sample and took some photos, which I will show in this post, along with some (quite different) photos of this formation on the other side of Thompson’s Draw. This image shows my traverse downhill to join “Big Hill” trail. There is a steep, muddy, drop down the top of the hill on Mountainside but then the trail (road, actually when weather is dry..never!) levels off. I climbed back up “Powerline Cutoff” and took this photo, which shows thin bedding in sandy rocks. This is a pretty easy climb in the 4×4; the steps are like an asphalt highway for going uphill. The hand sample I collected was not particularly interesting. I think the original top of this layer is to the left in the photo. 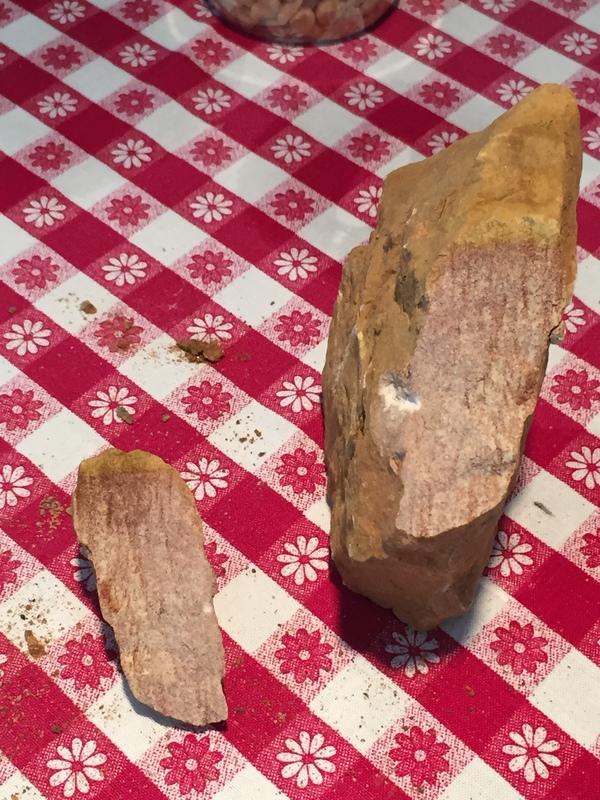 It has a reddish (buff…LOL) hue and shows some fine cross bedding. The reddish color suggests that the sediments were deposited above sea level ~320 mya, and the fine layering only occurs in fairly quiet water with rhythmic variations in water depth (e.g. tides) and low energy from waves. I drove a little further (location 2 in the above photo) and took this photo, which suggests an intertidal location because of the lack of wave ripples, and the irregular surface. I will jump ahead to the drive up the southern flank of Thompson’s Draw, where I found these great exposures of massive bedded sandstone with layers of thin-bedded sandstone with cross bedding. This is where the buggies go…there are trails over this ledge! This doesn’t quite fit the USGS description, but rocks vary rapidly over short distances. 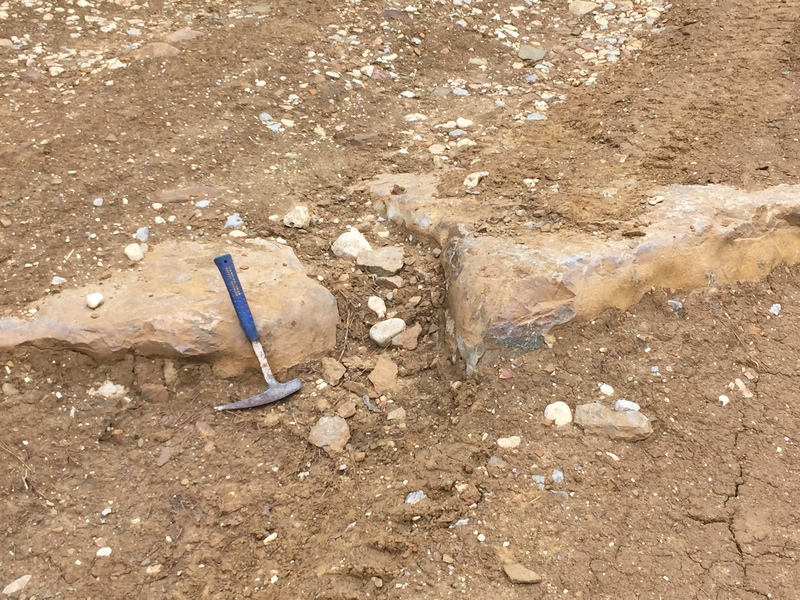 The reason in this case is probably the environment in which these rocks were deposited, and the time interval over which the sediments were deposited. This was a shallow-water environment a lot like the Gulf coast, with lagoons, barrier islands, sand bars, and mud flats. 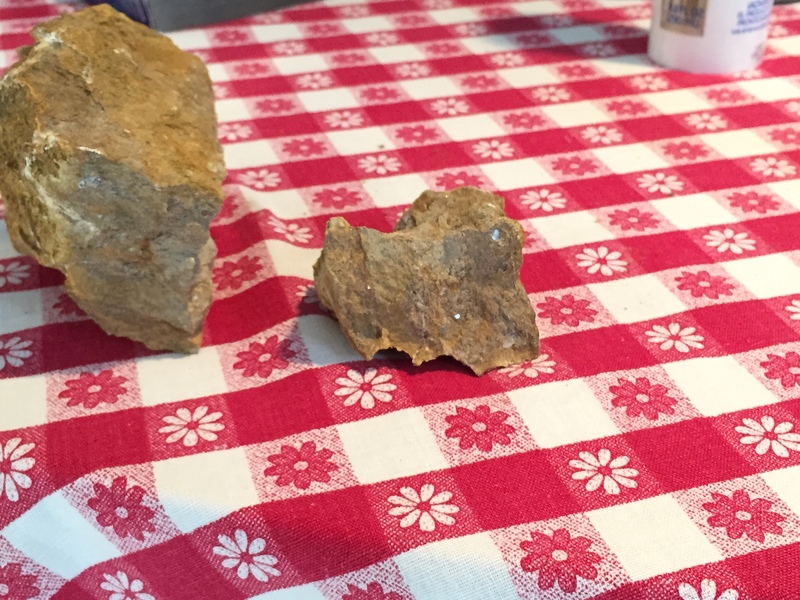 My drive down Mountainside also covered several million years of history, but we cannot date these sediments…we only know for sure that the rocks get older downward…LOL! After rising early and having a camping breakfast of bacon, eggs, and mixed fruit, I set off for the type-locality of the Pride Mountain Formation, which I passed as I arrived at the park. This location is shown in the prologue to this trip. It was easy to locate and I collected some hand samples and took some photos. Here is the official description, which is a compendium of multiple field efforts…needless to say, I didn’t see all of this! 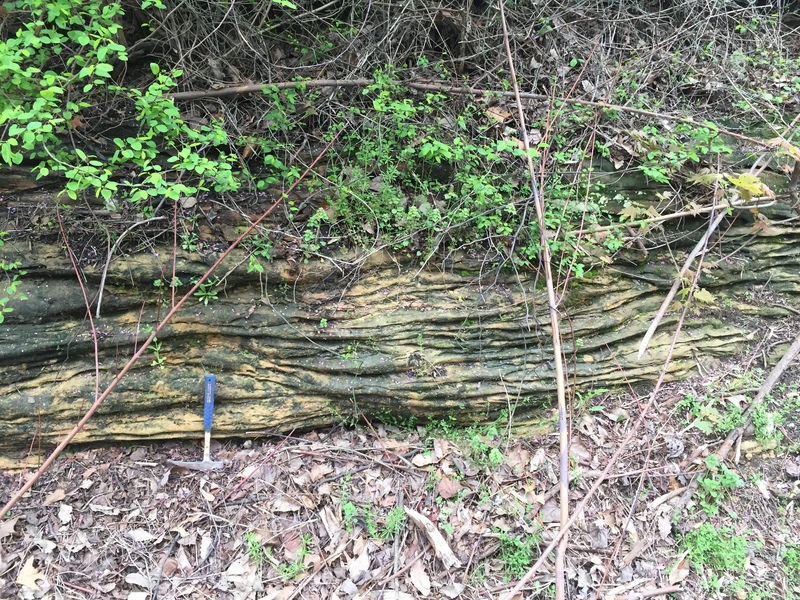 What I did see was dark soil that had eroded from the shale layers within the Mpm (Mississippian Pride Mountain Formation) and sandy layers with both massive and fine layering with cross-bedding. Here are some good images of these features. This is a typical shot of the thick beds, but they were not continuous even over 100 feet along the road cut. The next photo shows the cross bedding in thinly bedded sandstones. The bedding surfaces (assumed to originally be horizontal) dipped < 5 degrees in a northerly direction. 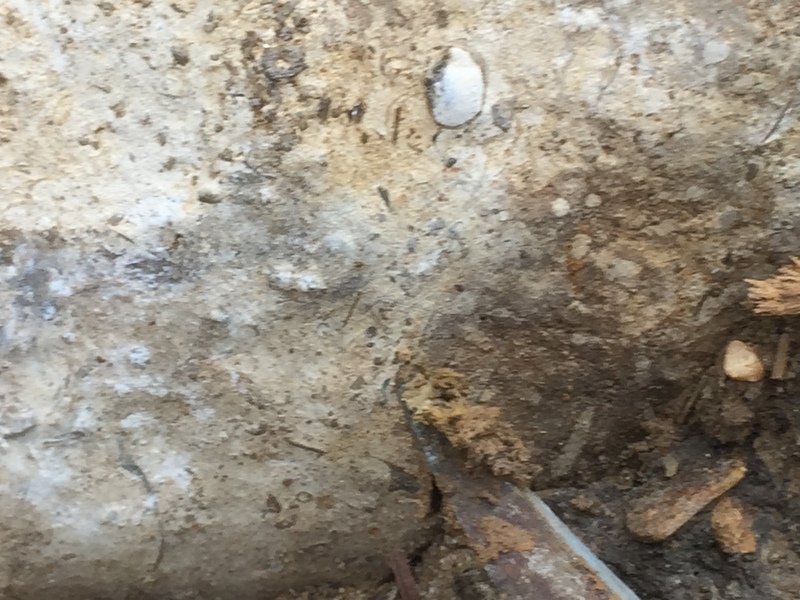 There was no reaction to HCl (weak acid) at this location, so any limestone was either buried by shale (soil) or not present. 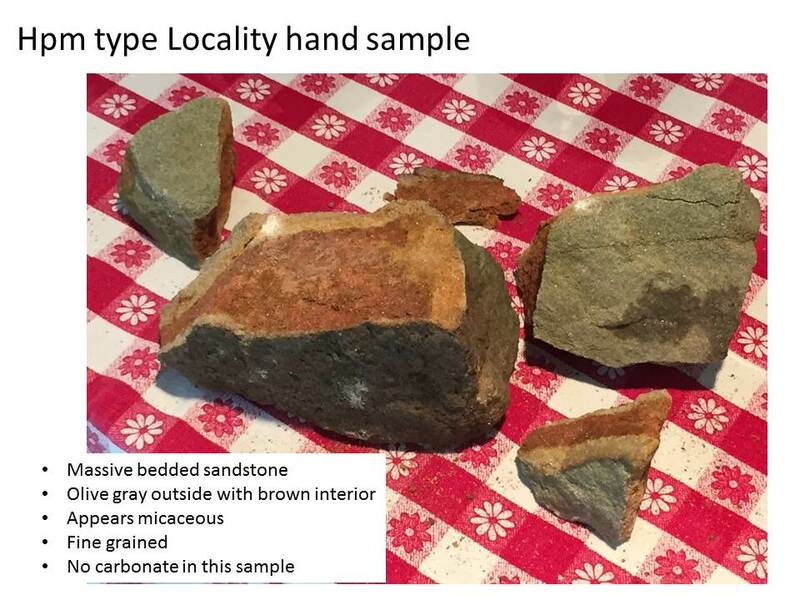 I collected a hand sample and brought it home for more detailed examination (sounds good, right). The outside was olive colored but the interior is a brown as in the formal description (above photo), and I saw flecks that are probably mica of some kind (i.e. micaceous). Mica is a flaky mineral that reflects light easily. Today’s post is actually from April 8 but I had to get back to do the necessary reading to make it useful. 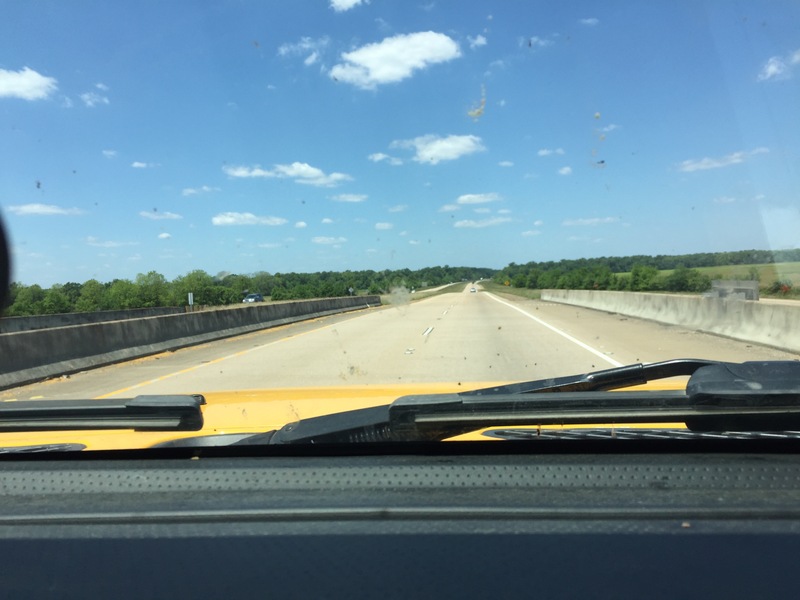 I drove up on Wednesday before the Mardi Krawl event began to have a fresh start the next day, and took the usual route up I-59 through Mississippi before heading north on US 45 at Meridian, MS. This is a leisurely ride from the coastal plain of Louisiana through the pine hills of SE MS, into the Jackson plain, the north-central hills, Flatwoods, black prairie, and the Tombigbee hills (MS History Now) before crossing into NW Alabama. As these regional names suggest, there is something going on that produced hills and prairies in what we think of as a hilly state. I enjoyed learning at least part of the reason why on this trip. This map of the regions will help in following along. 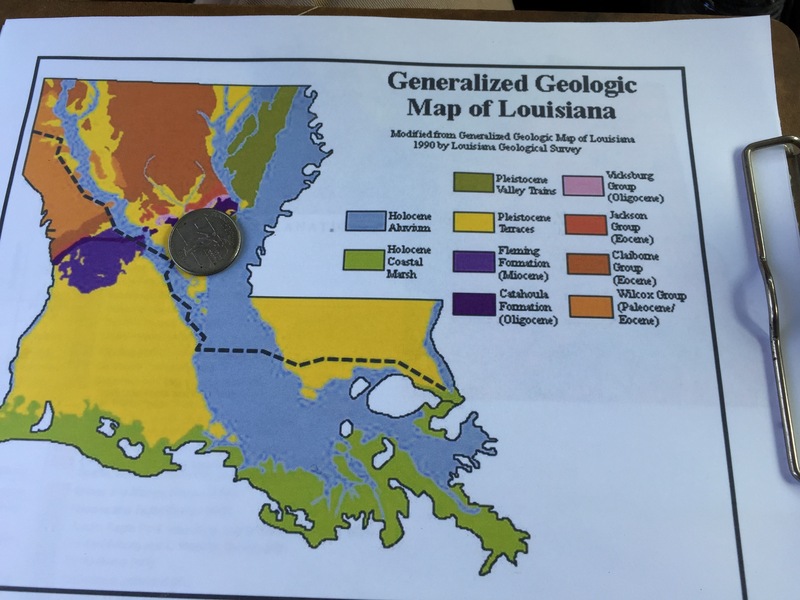 I crossed the Pearl River (still in LA) and immediately began climbing as I drove over Miocene (~23.3 mya) mixed sand and clay sediments on my way to Hattiesburg, MS. The forests were indeed pine woods just like on the coastal plain. There is an unconformity that only careful geologic mapping can identify between these rocks and younger Pliocene (~5.2 mya) sand and gravels. Note that a change from sand and mud to sand and gravel implies that the source of the sediment was closer (i.e. gravel doesn’t travel far in a river). As I approach Laurel, MS, the sediments no longer include gravel. At this point, my journey through time becomes disjointed because of erosion, which produces unconformities. This erosion results from many processes, including uplift of the crust and changes in climate but I am not going to worry (yet) about that! 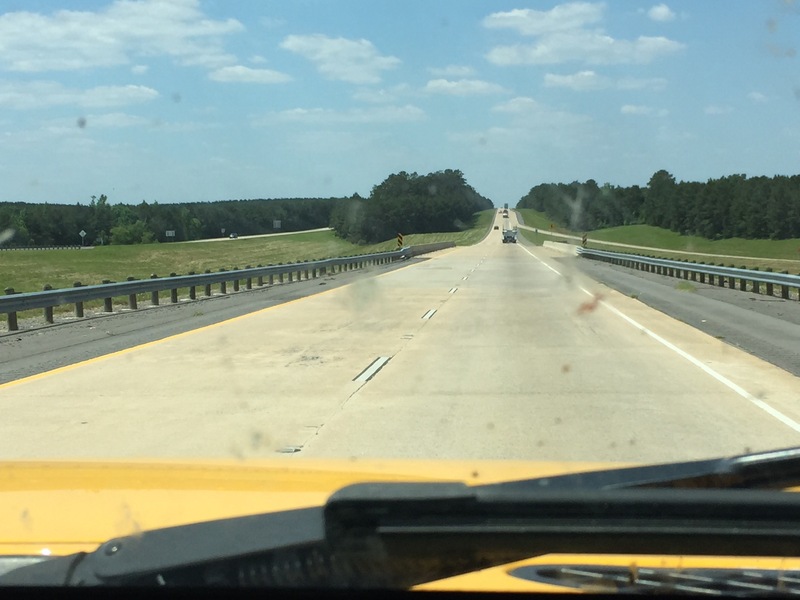 As I continue traveling up I-59 to the NE, I pass over another missing time period and encounter Oligocene (~35 mya) limestone (somewhat stable ocean) and volcanic ash…volcanism implies uplift usually. Then a lot of sediment is missing when I find myself in Eocene (~56 mya) clay and sand, which suggests a low-energy ocean like the Gulf Coast today. After yet another time interval of erosion, I am driving through older Eocene laminated clay (very calm water) and have a respite from all of this erosion to go back in time to nearshore sandy beaches, until the oldest Eocene sediments are reached after a brief erosional episode…these are fine sands, sandy limestone, and lignite (a burnable organic material, aka brown coal). 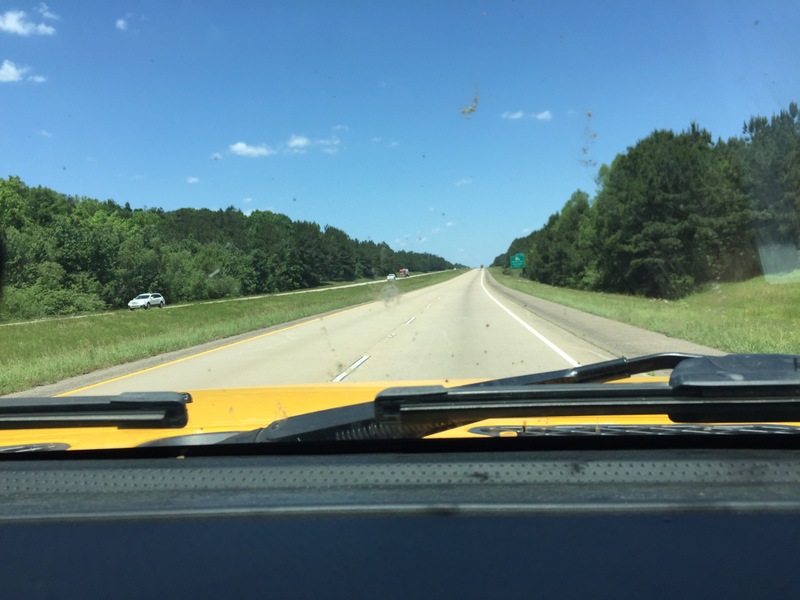 I leave I-59 at Meridian, MS, and turn north on US 45, and soon find myself missing time again before driving over Paleocene (~65 mya) sediments containing sand, kaolinite (a pure clay mineral) and clay with bauxite (suggesting a tropical climate…most bauxite today is mined from South America). These (tropical?) sediments are preceded (remember we are going back in time) by clay with sand lenses, like the northern Gulf of Baja, i.e., sand bars on a muddy coast. But then, I drive a little further and a lot of sediment is missing…now I am passing through Cretaceous (~145-66 mya) chalk and chalky sediments. After yet another disruption in my time travel schedule, I am driving over Cretaceous nearshore sediments that include sand, limestone, and chalk (very calm water). At this point I enter Macon, MS, and thankfully drive through slightly older chalk before encountering another missing time interval. The Cretaceous rocks north of Macon are nearshore sands and clays that suggest tides and waves (e.g., the east coast with its bays and mudflats). Then I arrive in Columbus, MS, and see these nearshore rocks for a while before smoothly passing into clay, then sand, and then gravel before hitting another unconformity. 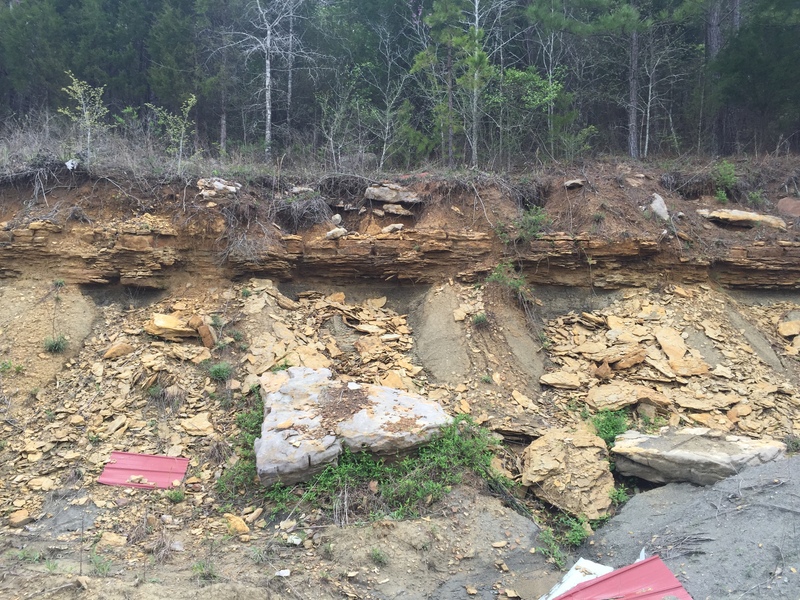 I crossed the AL state line about now and these (fairly) uniform sediments are replaced by Mississippian (~360-320 mya) sediments…I am in NW AL and a more continuous (although older) time interval. 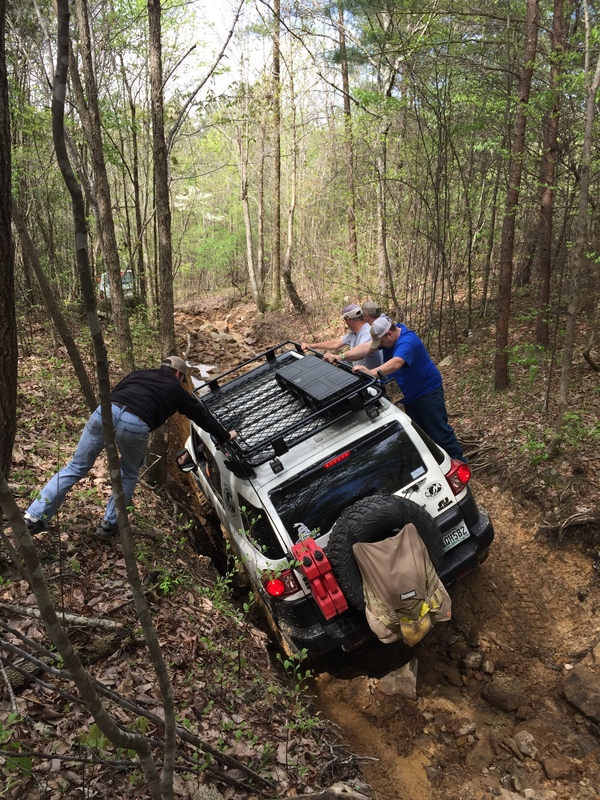 I am not qualified to reconstruct the geography of Mississippi during this ~320 my (million year) interval but I will try anyway because this is not the real reason for my road trip…to go wheeling! 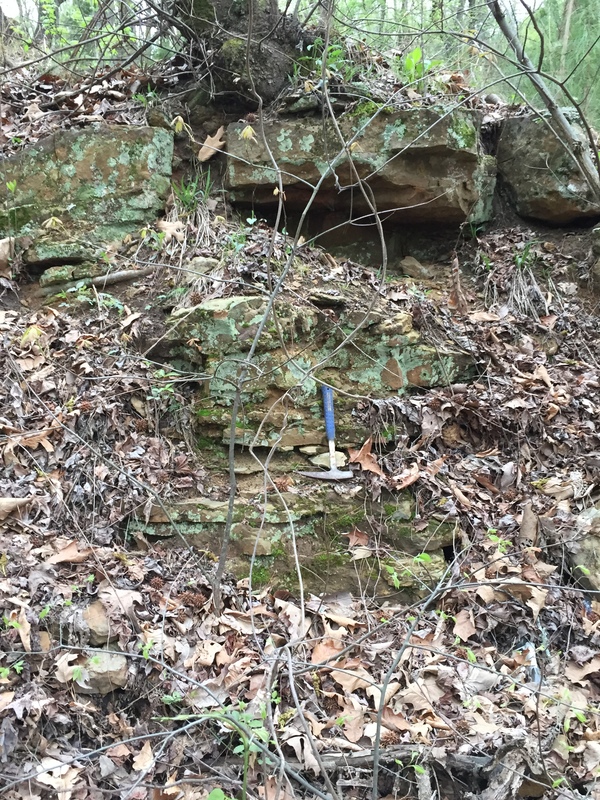 I will start at the oldest rocks I encountered in MS/AL, the Mississippian limestones and nearshore sediments. This was an environment not too different from the U.S. east coast today. The missing 175 million years were caused by the erosion of the ancestral southern Appalachian Mtns, when Africa said HELLO to N. America. These mountains must have been huge, like the Himalayas today and not continuous like the Andes, which resulted in different erosion/sedimentation at every location along their front (towards the central U.S.). Eventually, they wore down enough that the erosional products (i.e. 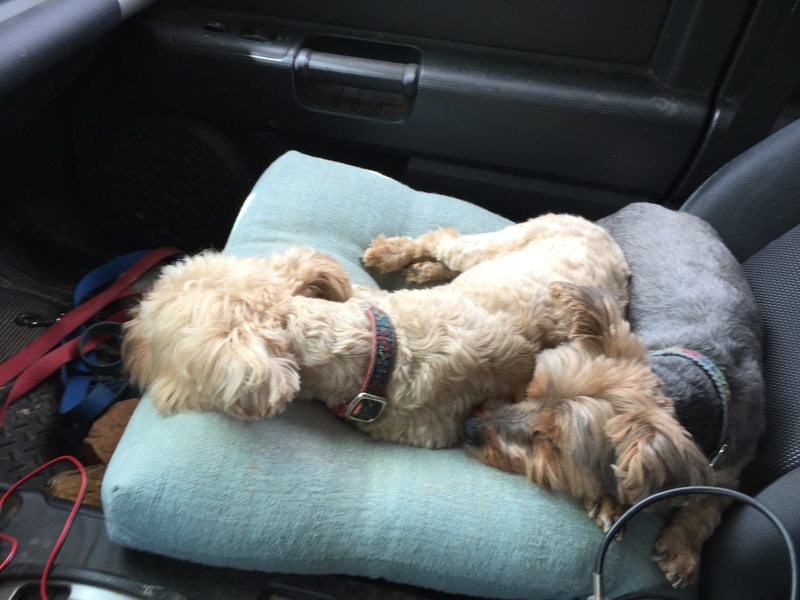 sand and gravel) were not themselves eroded. These sediments are seen near the MS/AL border near Smithville, MS.
A stable ocean (i.e. marine) environment did occur and was preserved in the nearshore sediments near Columbus, MS. All the while there were changes in sea level and adjustments in the earth’s crust that led to periodic episodes of erosion, resulting in some of the observed unconformities. The presence of chalk, which results from the quiet accumulation of algae-like plants, indicates stability for long periods of time. In the late Cretaceous, however, there was an uninterrupted shoaling of water depth and a coastal ocean returned (for a while). The sediments then oscillated between these coastal sands and limestones and land-based sediments like lignite and bauxite. All this time the land-mass was shifting northward from the equatorial climate indicated by the bauxites in the Eocene. Just when all seems set, volcanism began (bentonites are the clays that come from ash layers) even while a quiet ocean was present in MS, as indicated by the limestones near Meridian, MS in Oligocene time. The presence of land-based (i.e. 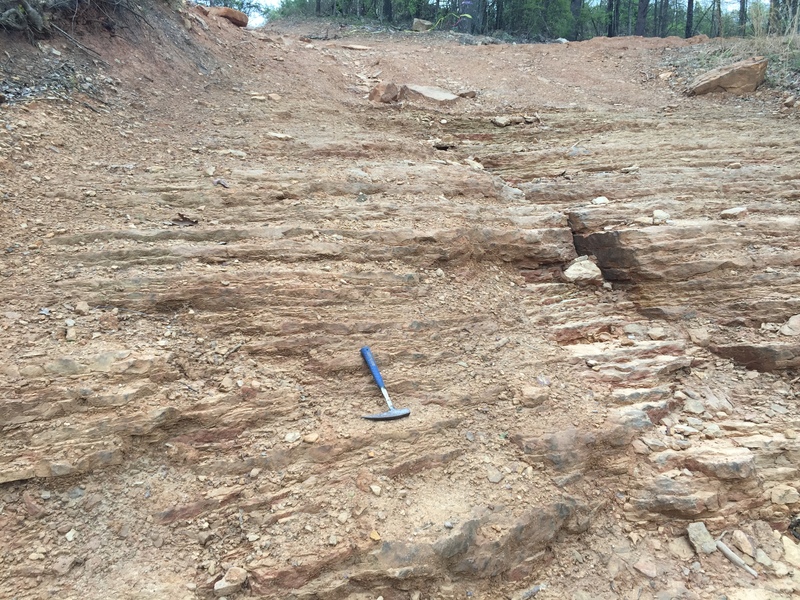 terrestrial) sediments in SW MS during later Eocene (~40 mya?) suggests that equilibrium was approaching this area. The large number of unconformities, however, indicates that erosion was still in charge, as it is today along the entire southern Appalachian Mountains and their descendent plateaus, like the one I will be visiting. I would like to relate these geologic episodes and their resulting sediments to the geographic provinces identified in MS. This is a difficult task but I will try from the oldest (i.e. NE MS) to the youngest (SW MS). This can be easily accomplished by overlaying the MS geologic map on the geographic province map using GIS software, which I don’t have. The Tombigbee Hills are coincident with the Cretaceous nearshore sediments near Smithville, MS; sands resist erosion better than clays. The Black Prairie is consistent (a wishy-washy scientific word) with the unconformity just SW of Columbus, MS, and that would also explain the Pontotoc Ridge because a pure sandstone layer (like the nearshore sands of late Cretaceous) would be resistant to erosion. Chalk doesn’t weather well and a layer like that between Macon and Columbus would result in a flatter landscape like the Flatwoods. 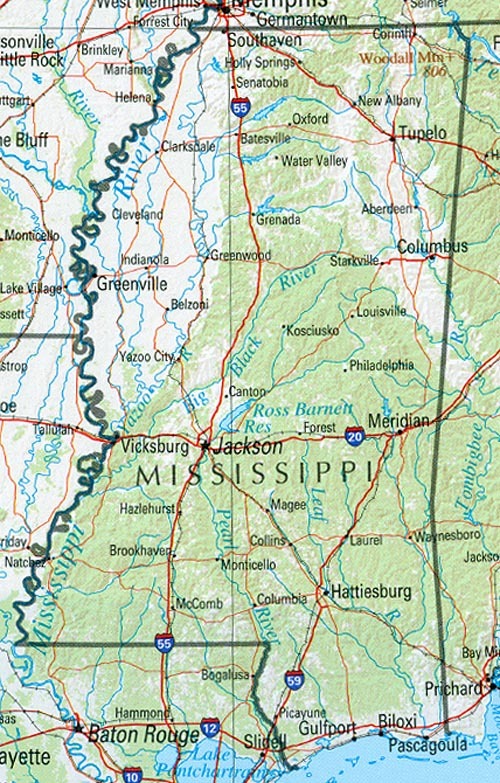 The North Central Hills province is consistent with irregular erosion of mixed sandy-muddy sediments like those between Macon and Meridian (Paleocene) whereas the Jackson Prairie could be the result of erosion of the mostly muddy sediments (and volcanics, which erode rapidly) that were deposited during the Eocene between Meridian and Laurel, MS. The Pine Hills are another product from irregular (aka heterogeneous) erosion of sandy sediments. And of course we shouldn’t forget that the earth’s crust is sinking along the Mississippi River for uncertain reasons, causing all of these layers of sediment to dip to the west. You can see my previous post about this.